For the second time in its history, BGS proudly took part in the interdepartmental science outreach event “Exploring Your Universe” at UCLA. The BGS exhibit, organized by Amanda Garcia and aptly entitled “Exploring Your Earth,” showcased some of the Department of Earth, Planetary, and Space Sciences’ finest rock samples. All three flavors of rocks were displayed (igneous, sedimentary and metamorphic, of course), along with a flume, a sand dune simulator, an Earth materials section, local geologic maps, and a collection of geologists’ tools. The youngest visitors also had the opportunity to earn the honor of a lifetime – the title of BGS Junior Geologist – by completing a tricky sand-matching challenge. Setting up for the exhibit proved to be an event on its own. Luckily, help came from an assortment of BGS volunteers, all of whom worked tirelessly to make “Exploring Your Earth” a fantastic experience. Kevin Coffey and Alex Shmurakov were responsible for rock-collection-diving, while Paulus McBurnett provided expertise on the flume workings and rock samples. Meanwhile, Austin Chadwick and Amanda focused on the organization of the exhibit. Many thanks were given to Gary Glesener, who provided much-needed assistance and some of the most impressive exhibit pieces, including three giant petrified wood samples! Visitors immediately started pouring in as the event began, keeping busy BGSers on their toes. Alex and Andy Perrine guided youngsters through the rock samples, while Austin oversaw the building of dams, braided streams and deltas in the flume. Amanda administered the sand challenge as Kevin explained the Earth materials and prevented total destruction of the classroom by chalk. Honorary geologist and BGS member Jackie Vaughan presented the geologist’s tools of the trade. Though perhaps a little overexcited, grabby, and rambunctious, the kids were eager to learn and didn’t mind offering up some impressive bits of geology knowledge themselves. A blast though it was, the end of the event meant exhausted, hungry, and sore volunteers. Their last bits of strength were saved only by Mike Lawson’s determined efforts to keep everyone fed, hydrated, and photo-ready. As the last of the visitors slowly trickled out the door, it was time for another successful BGS “Exploring Your Universe” exhibit to come to a close. With clean-up out of the way, the remaining volunteers toasted to their accomplishments and headed to Barney’s Beanery to celebrate a job well done. Pear Lake is a tarn situated in Sequoia National Park. The hike was ~19 km roundtrip, with an elevation gain of ~900 m from the trailhead at the Wolverton parking lot. The BGS showed up 10 minutes after the ranger station opened only to be told that all the Wilderness Permits for Pear Lake had already been issued, so they settled for Emerald Lake, a bit before Pear Lake on the same trail. The group hiked up the Lakes Trail to Emerald Lake, where they set up camp and took in the magnificent scenery of the Sierra Nevada's glacially carved granites and granodiorites. A few members took a quick and refreshing swim in the lake’s icy waters, then moved on to some good ol' trout fishing, which Alex Shmurakov seemed to be a pro at. The group fried up a few of the rainbow trout, both for taste and to do their part to help remove introduced invasive species. Nighttime provided excellent star gazing and, with an impending meteor shower, some excellent falling stars that lasted around 4 to 5 seconds while they descended and expired. On the hike out, the group took the Watchtower Trail alternate route. Parts of this trail were blasted straight out of the sides of sheer granite cliffs, leaving precious little distance between the hikers and a several-hundred-meter drop. All-in-all it was an excellent hike and a great way to spend a weekend! The Bridge to Nowhere hike is a classic Los Angeles Hike in the Sheep Mountain Wilderness, just north of Asuza, California. The bridge was part of an unfinished road system that washed out in 1938. This caused construction to be discontinued, but the arch bridge was already completed and remains spanning the San Gabriel River. The BGS, led by Paulus McBurnett, arrived in the afternoon to begin the hike with the expectation of coming out past dark. With a full moon overhead, however, the nighttime exit was a breeze. The hike was ~19 km roundtrip, with only minor elevation gain. Along the trail, BGS members viewed great examples of migmatites, sigma and delta porphryoblasts and a host of other metamorphic textures while crossing the river multiple times, and even stopped to chat with prospectors panning for gold. Upon reaching the bridge, just southwest of the Vincent thrust, the group witnessed other hikers bungee-jumping with a private company that leads such jumps every weekend. Though hunger of our party to participate was palpable, alas no one did, settling instead on watching others almost bash the beams on the underside of the bridge as they sprung back up from their initial jumps. The hike back out was pleasant and, surprisingly, included passing by a techno dance party with more Christmas lights strung up than on a typical holiday tree. It was an all-around great hike! expert led the group on a night snorkel to see the bioluminescence and nocturnal marine life. The next day, the group shuttled down the round to Airport-in-the-Sky and, after a quick bison burger, began hiking down Cottonwood Canyon to Little Harbor. On the way, they crossed a former plate boundary into subducted farallon plate, which changed from garnet-filled amphibolite schist to bright green actinolite schist to blueschist, with pockets of talc schist thrown in for good measure. Sarah Ratay, the Catalina Island conservancy’s botanist for eight years, pointed out the diverse flora and fauna, in many cases unique to the island. Upon reaching the shore, they took a well-deserved dip in the ocean and examined some Native American petroglyphs, then shuttled back to the Wrigley Center, pockets brimming with spectacular samples. The BGS started off their third day on the island by taking to the sea for a look at the Miocene volcanic and sedimentary units exposed in the sea cliffs. Kayaks allowed them to get up close to the rocks, even paddling through a sea cave in the basalt. After paddling to one of the islands quarries, the group relaxed on a pebbly beach before heading back. That afternoon, the group split up and snorkeled, kayaked, hiked, biked and ran as they pleased. The next day was more of the same. Then the BGS bid farewell to the island and boarded the ferry back home. BGS members and students from CSU Northridge congregated at the Las Llajas Canyon Trailhead in Simi Valley for a hike up into the hills. The route led through a thick deposit of conglomerate rich with pectin fossils, some exceptionally well exposed, and provided sweeping views of the surrounding countryside. Wildflowers dotted the hillsides, announcing the coming Spring. At the top of the trail, the group investigated abandoned mining equipment from an inactive quarry. An altogether excellent trip, and a great way to relax a little before finals week. 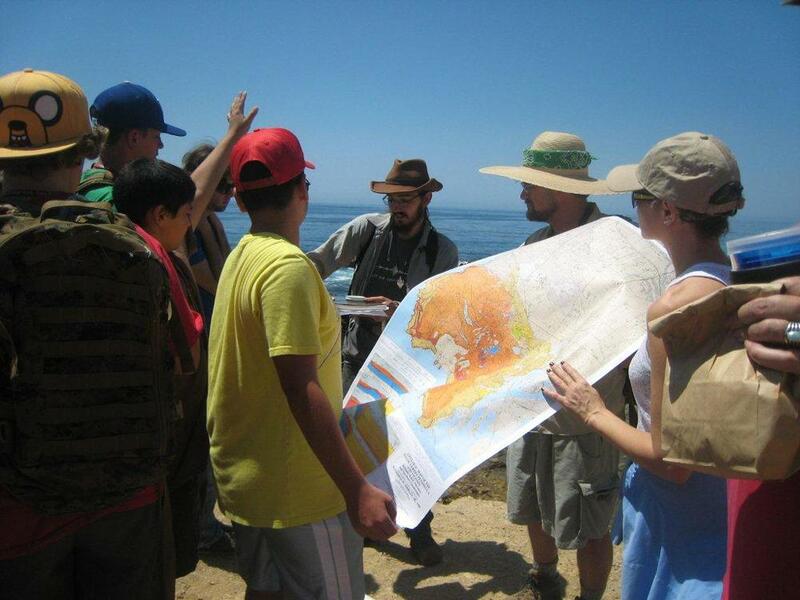 The BGS surveyed the geology of two parts of the Palos Verdes Peninsula on a sunny Saturday this February. The first stop was George F Canyon Preserve in Rolling Hills Estates. A short hike up the canyon’s nature trail led to an overlook of much of Los Angeles, and to one of the only exposures of the Catalina Schist on the mainland. While examining the outcrops, the group discussed the history of the schist and the impressive tectonics responsible for it. Back at the bottom of the trail, the group stopped by the nature center to see some of the area’s native animals. Then it was off to the beach, stopping at the local sandwich shop on the way. The second stop was White Point/Royal Palms County Beach in San Pedro, where steep cliffs of Altamira Shale rise from the shore. After a view of the sea and the uplifted marine terraces from the top, the group hiked down to the shore and discussed the Altamira Shale at the base of a tight and dramatically exposed fold. A short walk along the shore led to White Point, a place with something for everyone. The expedition took in large rip-up clasts sitting atop an angular unconformity in the shale, rock altered along fractures now filled with secondary quartz, deposits of tar that had oozed out of the shale, tidepools swarming with life, and the fresh scarp and rubble of the 2011 White Point Landslide, while differentially eroded beds protruding from the sand made excellent picnic benches. After lunch, a discussion of the geology, a look at the local Dibblee map, and a good deal of exploring, the group made its way back to UCLA via the massive Portuguese Bend Landslide. 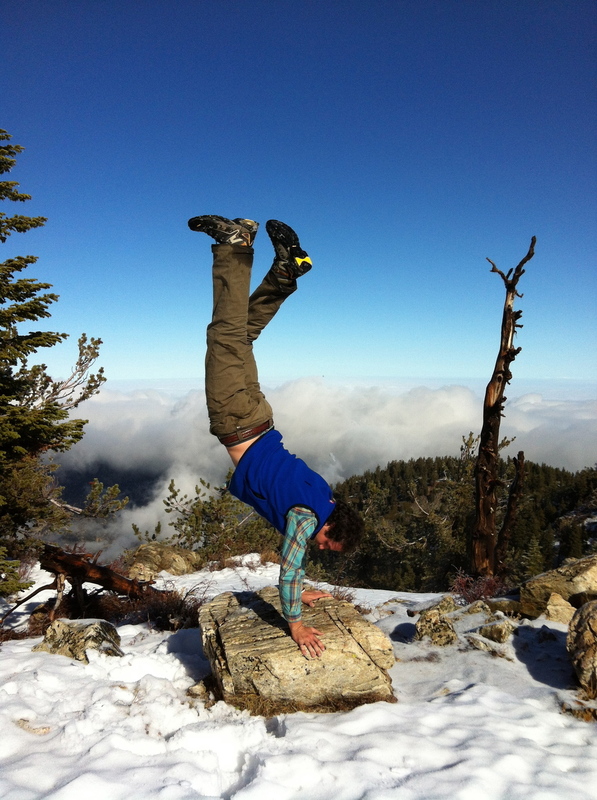 On a brisk January morning, BGS members and UCLA alumni donned snowshoes and cold weather gear and hiked to the top of Mount Pinos, which sits at an elevation of 2697 m. Outcrops of quartz monzonite poking through the snow dotted the ~6.5 km roundtrip hike, which also featured breathtaking views, a few snowball fights, and some Native American history. The hike was preceded by a stop at the local ranger station and a look at the area’s Dibblee maps to see the local lithologies and the nearby junction of the San Andreas and San Jacinto faults. After the hike, a handful of members stayed and camped in the snow. An excellent start to the quarter! 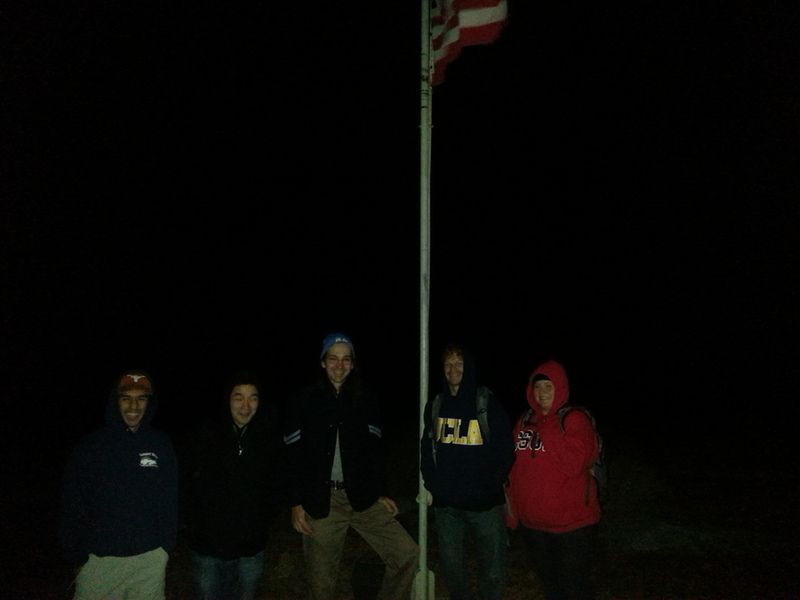 BGS members and other geology students gathered at the Chumash Trailhead of Point Mugu State Park under the light of the full moon for BGS’s first hike. Paul McBurnett organized and led the hike, which went up an old landslide, through a secluded valley, and finished at Mugu Peak. At the top of Mugu Peak, the group enjoyed spectacular views of the coastline, the Santa Monica Mountains, and the city of Oxnard. Paul mapped the geology of the area in the past, and was able to point out the landslide’s geomorphic and sedimentary features despite the darkness. The hike was enjoyed by all, and served as ‘Bon Voyage!’ for Paul, who left for his field area in northeastern India the next day. For the 4th year in a row the UCLA physical sciences hosted “Exploring Your Universe,” a day of interactive demonstrations and displays explaining the science of the universe for the local school children. As in the past, the Department of Earth and Space Sciences arranged and manned several themed rooms in the Geology building. This year, BGS members Dallon Stang, Kevin Coffey and Robin Reith put together the “Exploring Your Earth!” room, with some of the department’s best samples arranged into igneous, sedimentary and metamorphic tables, and labeled with their names, types and interesting facts. The room also featured an “Earth Materials” display, which paired everyday items, such as wiring, samples ofdrywall and fuel, with its corresponding raw earth form, such as copper, gypsum and crude oil. A running flume let the children experiment with erosion while getting their hands dirty. Other inspiring features of the room included: a sand dune simulator, a dissecting scope with olivine and basalt sand samples, and a montage of fieldtrip photos from ESS geology field classes. Evan Wolf, Dallon Stang and Kevin Coffey manned the room from 9 to 5, during which it was visited by hundreds of local school children – a successful day of geologic education and entertainment! Scouts from Boy Scouts of America Troop 854 gathered at the family house of BGS Vice President and former troop member Kevin Coffey to earn their Geology merit badges. The day began with such basics as “What is science?” and “What is geology?” and continued with the rock cycle, different properties of minerals, and the origin, extraction and use of all sorts of Earth materials—from oil to clay to rare-earth metals. 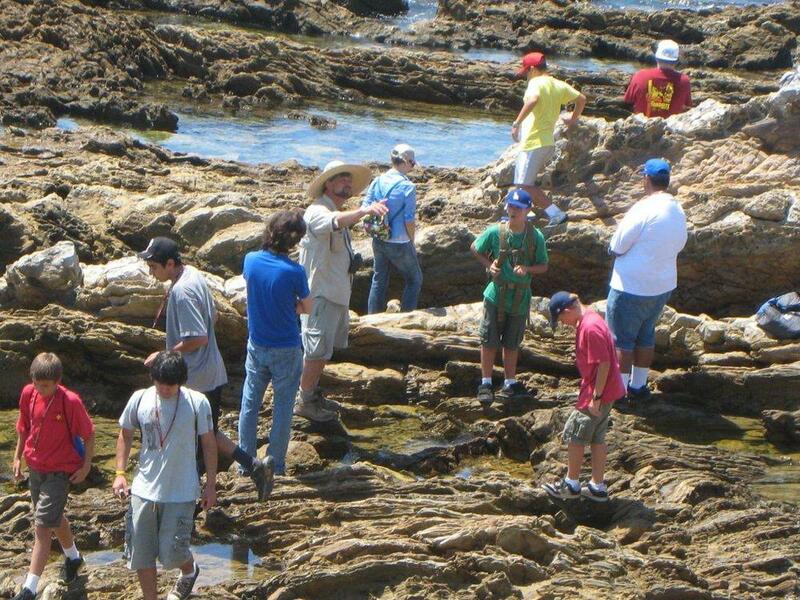 An extensive sample collection gave the scouts a chance to examine various rocks and minerals. Armed with their new knowledge, a streak plate, a hand lens, and a pile of pennies and nails, they were able to identify and classify multiple rock types. 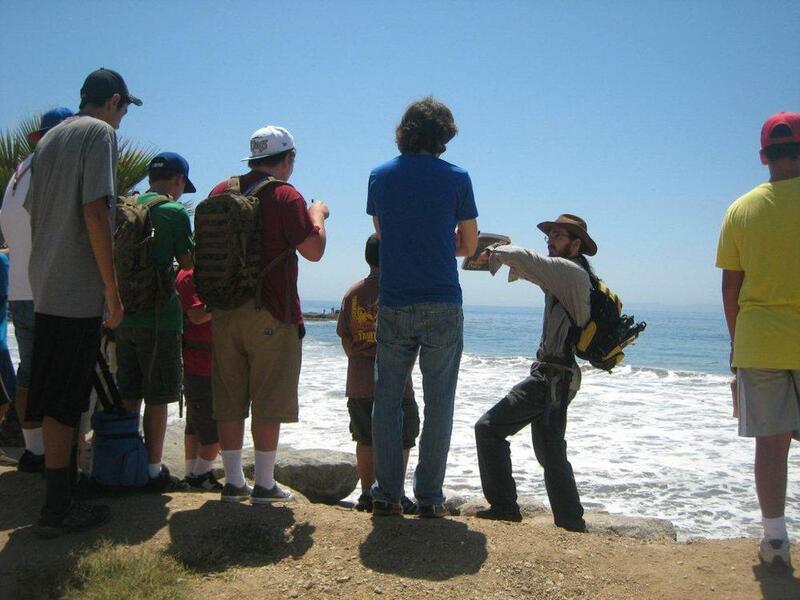 A trip to White Point / Royal Palms County Beaches gave the scouts a chance to see geology first-hand. 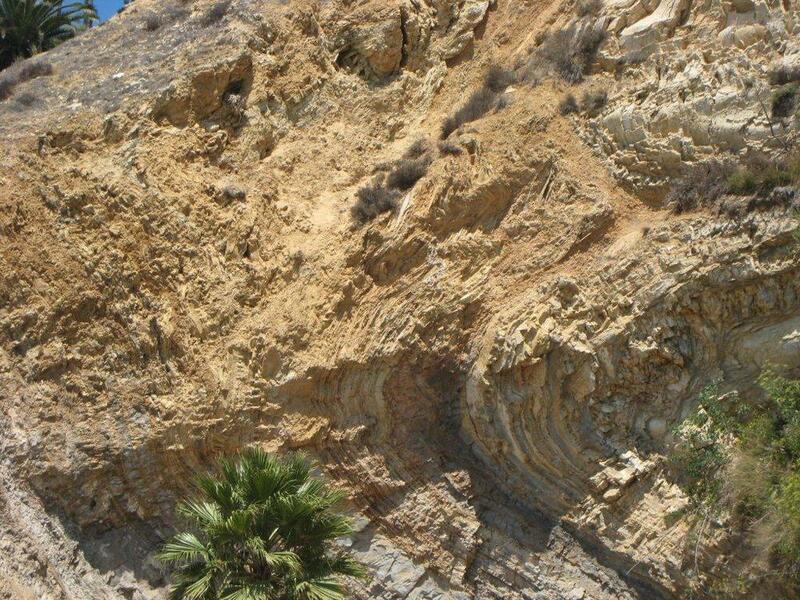 A short hike along the shore featured an angular unconformity, differential erosion, alteration and secondary mineralization along fractures, tar seeps, and spectacular folding, all within the Altamira Shale of the Miocene Monterey Formation. The hike also provided an excellent view of the 2011 White Point Landslide and an ideal spot for a picnic lunch. Scouts used a local geologic map to locate themselves and the landslide, and matched the lithology and bedding orientation with those on the map.